More than 60,000 horses will be thrown away in the U.S. this year. These are the ones who are not loved, who don t have friends to make tiny braids in their manes so they will always be remembered. These are the horses who have no one to walk their stable mates down to their graves to say good-bye. There s no one to cry on their faces as they are given the last gift of a peaceful death among loving friends. What will happen to them? There are already old, starving horses being found turned loose on public lands. One old gelding was left tied to a tree by some idiot, left to die. The horse was found by hikers days later. The stupid owner didn t even leave him loose so he could eat or drink. Though this is only one example, many reports are trickling in of such abandonment on public lands. There are horses whose spirits no man knows, nor cares about and horses who gave so much or more than our Snowdrop. There are horses who are used up and worn out, tools of the trade. When they grow old or broken they are thrown away and replaced by new ones. Where under heaven will these unloved throw aways go? What about the thousands of high maintenance, shattered, ex-racehorses (thoroughbreds and trotters)? Some are as young as two years old, lame beyond repair, who could live another 25 years. No one wants them, no one loves them, and no one wants to be responsible for them. Where will they go? The list goes on and on. Those of us running tiny rescue shelters weep for these horses. We cannot help them. We do this job for love. We have so little money. We are all exhausted as we slave for the few in our care, those that we can help. When it is time for them to die, we rejoice in their lives and the time we had with them. They die in our arms. We grieve over the loss of every single one, because we love them. There are so many that no one loves. So many. This year (2007) it appears the radical animal rights groups succeeded in fulfilling one of my greatest fears. They have shut down the last three slaughter houses for horses for human consumption in the USA. Let me first say: I hate slaughtering horses. Hate it! But even God says it is okay to eat horses, to eat any animal. But he also points out that they must never suffer. He is aware of their spirits. Not even a sparrow can fall from the sky that He does not know it. Horses are mentioned many times in His Word in the company of angels, being ridden by angels. I suspect horses are very special to God. Horses are loyal and true. They are the greatest and most useful partners the human race has ever known. We owe them something. Being dead, with no more suffering or starvation, is definitely not the worst possible scenario. Pain is a terrible thing, especially when there is no hope that it will ever end. I saw the pain go out of Snowdrop s face when she fell asleep in death. For the most part, only healthy horses are slaughtered for human consumption. Those that are destined for European tables are of a standard size and weight. They are very seldom older grays, as the ones that develop melanomas in any quantity are rejected. They are seldom ponies or full grown draft horses. The EU rules are strict concerning both health and humane care of the horses. The slaughter houses in both the U.S. and Canada fall under these rules. Probably those in Mexico owned by European countries follow the same guidelines. The problem lies in the fact that Mexico has few, if any, humane laws. Horses are going to be slaughtered. The Europeans are going to eat horses. All that has been accomplished in closing U.S. plants is that the horses will have longer distances to travel through terrible heat under unimaginable conditions. After they cross the border into Mexico we have no control over their treatment. The small, independently owned slaughter houses are deplorable. with slaughter bound horses down there. Read Ernest Hemingway s book Death in the Afternoon. What happens to these horses in the bullrings in both Spain and Mexico where they are drugged and blindfolded is so horrible that I can t allow my mind to dwell on it. The atrocities go on and on. they move onto some other cause in which they choose to interfere, leaving the horses to their fate. There just aren t enough rescues or individuals who can afford this many unwanted horses. There is no money to support them and no where for them to go. I have spent most of my working hours seven days a week for the past nine years caring for our horses. I don t get paid. I am not alone. Those of us who rescue horses for love are forever rewarded by receiving love in return from them. Unfortunately, love does not pay for their upkeep, nor does it help other horses in need. This country is now full of horses that have nowhere to go. It is not a horse's fault that it was born; yet almost every single birth is planned. This is a human problem, not a horse problem that needs to be solved. Every single horse born in this country should be guaranteed care for its entire life by its original breeder and all other responsible parties in between. Every horse deserves a humane death at the end of its life. Until the racing industry stops throwing away the unfit or crippled, the Premarin business dies by the wayside, the backyard/color/etc. breeders stop  list goes on and on, unwanted horses need a place to go where it can just be over. Until then, we must keep our horses out of Mexico. For more information, check out The Horse from April, 2005 at http://www.thehorse.com. See the article Welfare in Mexico. from their February, 2007 issue. Also see the article Slaughter: Are Voices Uniting? in Horse Illustrated from December, 2007. These articles are incredibly disturbing. The pictures are graphic. Be prepared. Then, you decide. I rescue horses. At Eye of the Storm we have lost three horses this year. The third was Snowdrop. Unlike the first two, Noogie and Sun, it was not sudden but planned. much. I was no longer able to manage her pain. Her spirit had retreated to that gray place where the wounded go when there is no hope. I knew from the look in her eyes that it was time to let her go. We loved her so much. We all took time to fuss over her. If love could have saved her, she would still be carrying children on her back and loving us all in return. She had an incredibly powerful spirit that, until now, had shown in her fiery, dark, beautiful eyes. She was so brave in all those years of pain, she never whimpered. She was born at Vantage Point Farm in Washington State and registered as VP Juhlie. Her father was El Hilal. I guess he was some kind of fancy guy (see his photos and impressive show record) and I guess she was once a very fancy girl. She had five foals. She had a freeze brand on her neck. Years went by. I have no idea how she finally ended up as a camp horse. What happened in all the years in between? I know only when I found this tattered little soul that she had finally made it home. She stayed with us for the last seven years of her life. She was loved, honored, and cherished. She never worked again. She was all paid up. She didn't owe the human race a thing. On the last day of her life we made seven tiny braids in her mane, wove in silk flowers, and took her picture for the last time. She looked like an exhausted fairy princess pony. There was almost no light left in her eyes. We snipped off the tiny braids to keep and to remember. The day was perfect. There was warm, soft rain pouring down upon us as we took our last walk together. We took Solomon and Junebug, too. We made a sad procession down to the grave site. Junebug was the only horse friend Snowdrop had - the only one she ever had, the only one she had physical contact with as they groomed each other. Solomon loved her, too - probably loved her the most. As she fell asleep in death I held her face as the last of the light went out in her eyes. The soft, warm rain fell upon us all as we watched the pain leave her body forever, as she received the last gift - the end of a life of pain in the loving arms of her friends. Even the sky was crying. Solomon and Junebug came to see and touch her, to know that she was never coming back. And so ends the life of one sweet, beautiful little horse. 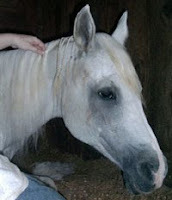 So many had been touched and changed by knowing this shattered little gray mare. So many loved her. 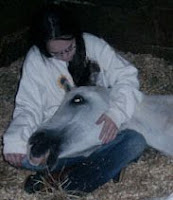 Most of us love our horses and can imagine their end of life care in no other way. Unfortunately, in most facets of this industry, there are horses who are not beloved family members to be cared for despite illness, disability, or old age.